The 18-basket course at Pier Park is as challenging as it is beautiful. Tucked away at the end of a peninsula near the confluence of the Willamette and Columbia Rivers, the park itself is somewhat remote. The park itself is 86 acres and offers more than just the disc golf course. The park has athletic fields, a skatepark, basketball, tennis, an outdoor swimming pool, playground, and even a wading pool. It makes for a fun place to hang out after the game or gives everyone in the group something to do, even if they do not like to play. 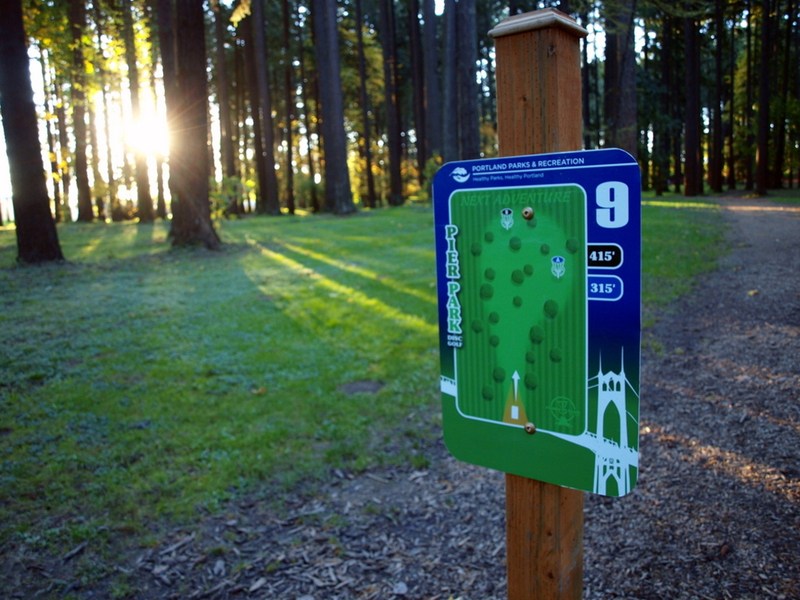 It is the closest disc golf course to Portland, which make it convenient for a quick game. The course has a little bit of everything: uphills, downhills, doglegs, and tunnels and all set in amongst giant Douglas fir and western red cedars. They influence the game quite a bit and on every hole. Two alternating basket placements give the course a wide range of distances (273’ – 548’) depending on hole or the season. The pads are full-size and signage is clear. The course can get crowded quickly and parking is limited, so if at all possible, choose to go during off days and hours. There’s also a new disc golf pro shop, Huck Lab, in the neighborhood of St Johns just a couple miles before you arrive at the park. If you are looking for a good food and drink option, try The Leisure Public House in St Johns. The welcoming neighborhood watering hole has a small but satisfying menu, great drinks, and a patio complete with bocce. The elevation gain and loss and technical gaps make this challenging for any level of disc golf player. The beautiful Doug fir trees are not only beautiful to look at, but also add to the challenge of the course. At the same time, there is a lack of water obstacles and bushes, which caters to beginners. To get to Pier Park from Portland, take I-405N to exit 3 for US-30/Saint Helens, then keep right to continue on NW Bridge Avenue. After the road turns slightly right, it becomes NW Saint Johns Bridge. Continue on N Philadelphia Avenue. Take a slight left on N Philadelphia Avenue and turn left onto N Lombard Street. Turn right onto N Bruce Avenue then take a left on N James Street. The first tee is at the corner of Bruce and James. The park is open from 5AM until midnight.